Eric has been a travel expert for over a decade and plans vacations for the leisure traveler in all areas of travel including ocean cruises, river cruises, all inclusive resort packages, global villa rentals, European rail packages and escorted or individual land tours. 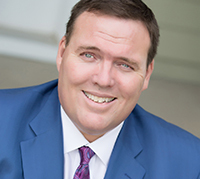 Eric specializes in all facets of travel reservations for individuals or couples, as well as planning and coordinating group bookings for families, school reunions, family celebrated anniversaries, organizations and corporate getaways. While Eric specializes in the luxury market, all types of quality travel products are available to him to provide to his guests.